Chocolate and pears make perfect partners. 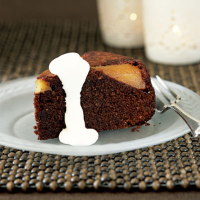 Here, a jar of baby pears turns this simple chocolate sponge into something really special. Serve warm with cream. Preheat the oven to 190°C, gas mark 5. Grease and line a 20cm loose-bottomed cake tin. Drain the pears, reserving the syrup. Slice the pears in half lengthways and arrange cut-side up in the base of the cake tin. Place the chocolate in a heatproof bowl with the milk and melt over a pan of gently simmering water until smooth. Leave to cool slightly. Place the butter in a large bowl with the sugar and beat with an electric or balloon whisk until light and fluffy. Gradually beat in the eggs a little at a time, adding a couple of tablespoons of flour at the same time to prevent curdling. Stir in the melted chocolate, then sift in the remaining flour. Add the ground almonds and fold in lightly with a metal spoon until evenly combined. Spoon the mixture over the pears, smoothing out the top. Bake for 1 hour 15 minutes, until a skewer inserted comes out clean. Leave to cool in the tin for about 15 minutes. Meanwhile, place the reserved syrup from the pears in a small saucepan and gently simmer until it is reduced by half and is slightly thickened. Before removing the pudding from the tin, make a few holes in the top using a skewer and spoon over the syrup, letting it soak in completely. Invert the pudding and serve warm, cut into wedges, with thick pouring cream. These pears are really delicious even without sponge. Make a simple pudding by pouring hot chocolate sauce over the pears and serving with ice cream.